OXNARD, Calif. – A Santa Barbara teen battling a disease received a gift from his favorite NFL team. 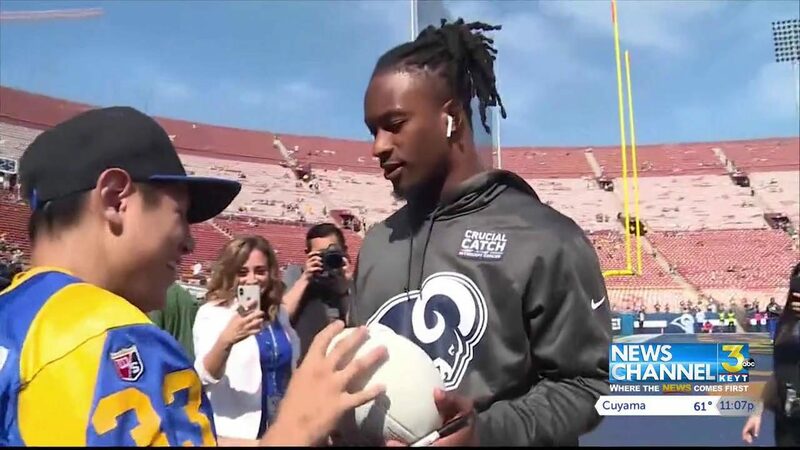 The Los Angeles Rams surprised Gilbert Cabrera with tickets to Ram's game as well as meeting with his favorite player, Todd Gurley. Seventeen-year-old Cabrera watched in complete awe as his favorite team, the Los Angeles Rams, warmed up on the field before facing off against the Green Bay Packers. The senior at Dos Pueblos high school has been battling gastrointestinal disorder since he was a kid. Earlier this month Make-A-Wish Tri-Counties invited Cabrera and his family to a benefit dinner with the Rams and gave him a surprise he would never forget. Sunday was that moment that Cabrera would come face to face with his favorite player, Todd Gurley. After meeting and taking pictures with the Rams star running back, the Rams organization took Cabrera inside the locker room. The day got even sweeter as Cabrera spent the rest of the day on the sidelines as the Rams water boy. Earlier this month the Rams organization also surprised Cabrera and his family with tickets to Super Bowl LII.